Get airborne with the Fabulous Foam Flyer! Get loud with the Water Gong or Straw Oboe! These are just a few of the wild and wonderful projects in The Science Explorer,the ultimate home science fun book. You'll get to make bubble bombs, amaze your friends with optical illusions, make crazy music with your own homemade instruments, and even take apart a real camera. Not only will you have hours of fun, but you'll learn all about the world around you and become a "science explorer"! 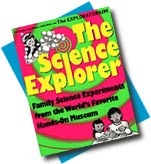 The Science Explorer, the first family-oriented activity collection from the Exploratorium is specially designed to be used by parents and children together. -Each activity is accompanied by a special, easy-to-understand "What's Going On?" section that helps explain the underlying scientific concepts and gives tips on how tocreate your own related experiments. -This book has been written with support from the National Science Foundation. All of the experiments have been tested by hundreds of families across the country,who selected the activities that were the most fun, the most informative, and the most likely to bring valuable "togetherness" experiences to busy families. -Each experiment tells you how much time is required, what simple ingredients you'll need, and whether it can be done by kids alone or by kids and adults working together.